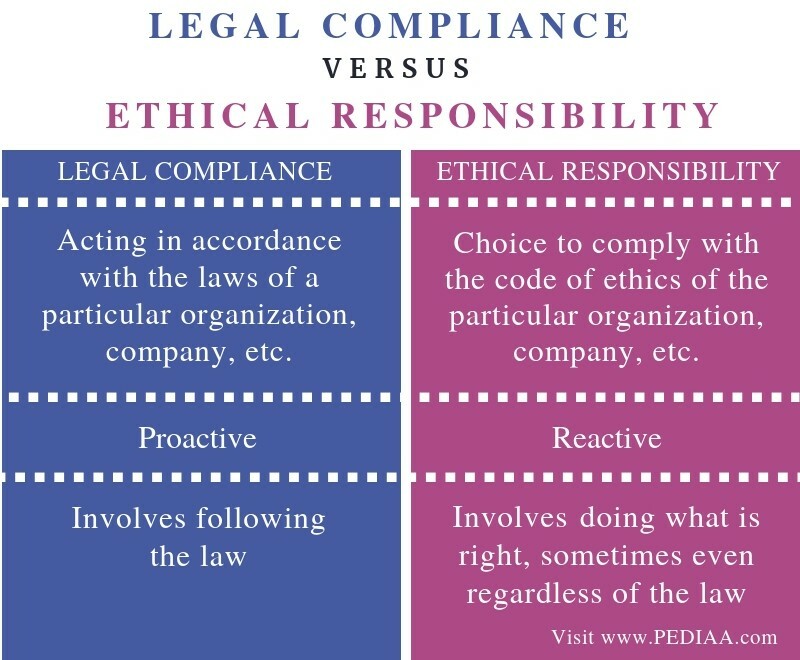 The main difference between legal compliance and ethical responsibility is that the legal compliance is bound to obey whereas the ethical responsibility is a choice. Both are concerned with the manner in which a person has to behave in with accordance to laws and ethics relating to a certain society, organization, etc. However, both these are common terms in workplace terminology. 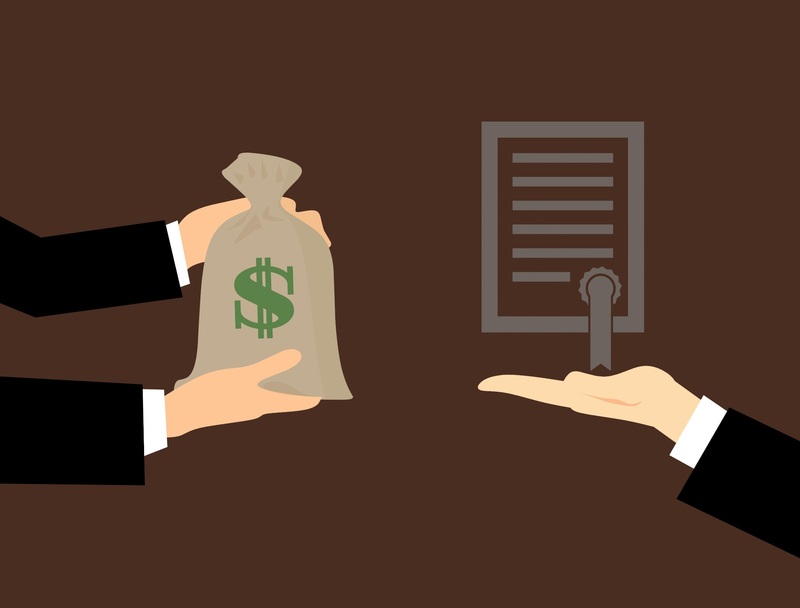 Legal Compliance refers to complying or behaving in accordance with the legal system or legislation of a country, organization, institution, company, etc. Compliance under the legal system means following laws, rules or policies of an organization/ company. Legal compliance is, therefore, behaving according to these laws and legal obligations. Thus, the authority of a certain country or the organization requires people to follow or comply with the legal system of that organization. • To comply with the company/organization rules and regulations and maintaining the employee rules and regulations, etc. • The employees and the authorities should always act in accordance with the law of the organization. Ethical responsibility is the ability to recognize and act upon the ethical values according to the standards within a given field or context. Hence, ethical responsibility refers to the responsibility to follow the code of ethics of a certain organization, institute, society, etc. Ethics are the moral codes that are followed by people in a certain country, society, organization, company, etc. Therefore, ethics are rights that are considered morally right. Thus, they are not laws but obligations. Furthermore, it is a choice of a person to follow these ethics or not. Moreover, ethics in an organization differ accordingly. 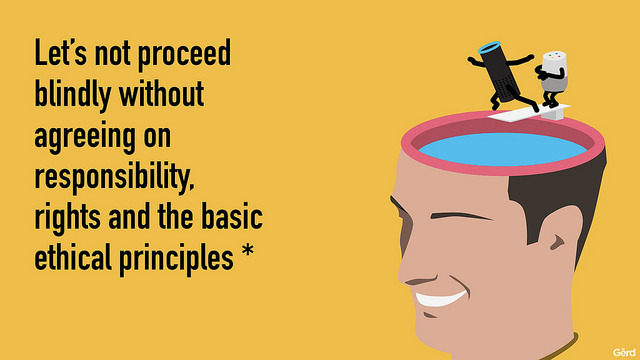 Thus, the ethical responsibility is the responsibility a person has to accord himself according to these code of ethics of the particular organization or institute. Likewise, considering ethics as a fundamental value to a company/organization and being responsible/considering it a responsibility to maintain these ethics elevates the overall performance. Also, this will avoid employee unrest and dissatisfaction and other related issues towards the improvement of the company. Ethics is something to consider when taking actions, sometimes even disregarding the laws. For example, a company has an ethical responsibility to pay its employees what their labor is worth such as giving them bonus and salary increments and to provide a respectful workplace free of harassment etc. This is not legal compliance, rather an ethical responsibility since this is a choice. Legal compliance and ethical responsibility are common in employee law terminology. Both are essential elements for the proper maintenance and development in an organization, society, etc. Legal compliance refers to acting in accordance with the laws of a particular organization, company etc. while ethical responsibility is the choice to comply with the code of ethics of the particular organization, company etc. Thus, this is the main difference between legal compliance and ethical responsibility. Ethical responsibility is proactive while legal compliance is reactive. Moreover, it’s entirely possible to be ethical without being compliant. Hence, this is another major difference between legal compliance and ethical responsibility. Compliance is following the law while ethics is doing what is right, sometimes even regardless of the law. Legal compliance and ethical responsibilities go hand in hand. However, they are distinct principles. The main difference between legal compliance and ethical responsibility is that legal compliance is bound to obey whereas ethical responsibility is a choice. 1. Fredman, Josh. “What Is the Meaning of Ethical Responsibility?” Bizfluent, 1 Feb. 2019, Available here. 2. Watson, Ashley. “Ethics vs. Compliance: Do We Really Need to Talk about Both?” The Legal Intelligencer, 27 Jan. 2014, Available here. 3. Sarokin, David. “What Is the Meaning of Ethical Responsibility?” Small Business – Chron.com, Chron.com, 29 Jan. 2019, Available here. 4. “The Important Distinction Between Ethics and Compliance.” Corruption, Crime & Compliance, 24 Nov. 2014, Available here.